Hey everyone itzBolt here, I’m back with some more card reviews from the upcoming expansion. Since our last post there have been four new card reveals. Two reveals from the Americas Winter Championship, one from the Chinese Championship and the fourth from the Japanese Championship. Credits to Hearthpwn for all card images. Text: Summon five 1/1 Silver Hand Recruits. This card costs way too much, we already have a similar card being Dark Wispers and it isn’t used and is more flexible. 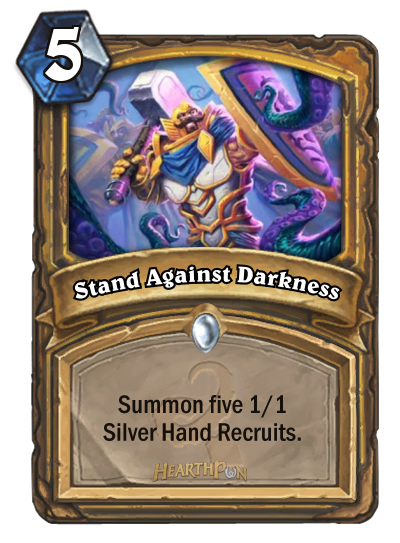 The only good card that synergizes with Silver Hand Recruits is Quartermaster and that is being rotated out of Standard. What made Muster for Battle so good was that it was an on curve card after Shielded Minibot and it also included the Light’s Justice. In the old midrange Paladin you were also able to play Quartermaster for insane value. This card is a lot clunkier than Muster for Battle. The 1/1s get dealt with really easily by AoE and you’re investing a lot of mana into it making this card very risky. It’s very unlikely that this card will see play without something that gives insane value with Silver Hand Recruits. Text: When this minion is damaged, summon a 2/2 gnoll with Taunt. This card looks very playable when it comes out, killing it without a spell is very annoying to do because the gnolls have taunts which means you need a big minion or hard removal to deal with this creature. 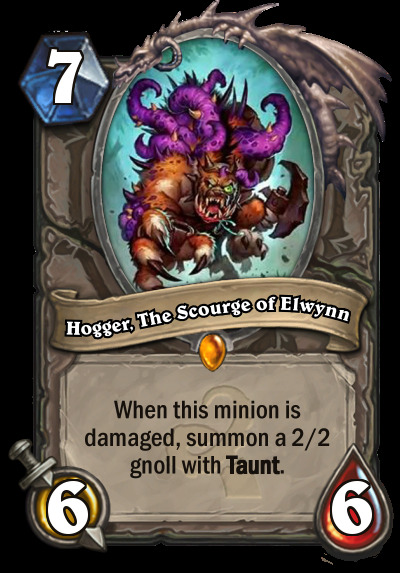 This version is a lot better than the original Hogger as AoE is a bit worse against it. 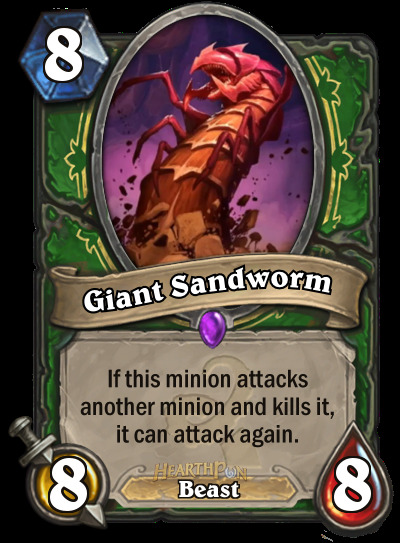 It doesn’t die to the current Big Game Hunter which is very nice, although BGH is likely to be one of the classic card nerfs. Seems really good in Priest as you can heal it and get more gnolls, however, it may be hard to put in the deck as Priests always seem to be full on everything and impossible to figure out what to take out. Text: If this minion attacks another minion and kills it, it can attack again. Hunter seems to always get the heavy costing and awkward legendary minions. King Krush is too high costing to play in any Hunter deck, Gahz’rilla is a big minion that gets buffed when it is damaged. This card can attack twice when it kills a minion, which means it can kill about two medium sized creature most of the time. Hunters don’t really have anything to heal it other than using a Houndmaster buff on it. This may see use in Midrange Hunter with the removal of Dr. Boom, but we may just see Ragnaros as its replacement again. It seems like a push towards Control Hunter, but with our current cards it won’t happen so we will have to see what the new expansion will bring in terms of Hunter cards. Text: Battlecry: Destroy all enemy Secrets. Gain +1/+1 for each. Kezan is getting rotated out of the format, meaning there are no more neutral cards to deal with secrets.This is its replacement as well as being answer to Secret Paladin in Wild. Will this see play? It’s really hard to say, it all depends on how prevalent secret decks are going to be after the expansion. If there are a lot of secrets, this card is definitely not that bad, if you miss a secret class it does decently well to fight against aggro as it has four health. It’s not that great against control however, but that’s always a problem with tech choices it can’t be good against everything. I am uncertain how prevalent secrets will be in Standard after the expansion especially due to the removal of Mad Scientist. Decks may continue playing their secrets like they always did (Hunter), or they may remove them and add different cards (Tempo Mage). 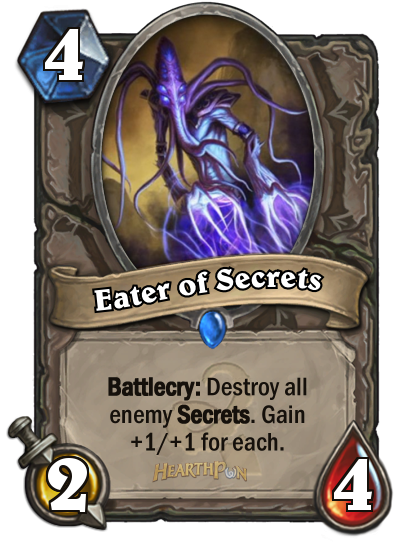 I think this card will see play if players decide there are enough secrets to tech towards. That’s all the revealed cards we have so far, hope to see more cards soon!